Get set for Christmas! This two day (plus one evening!) 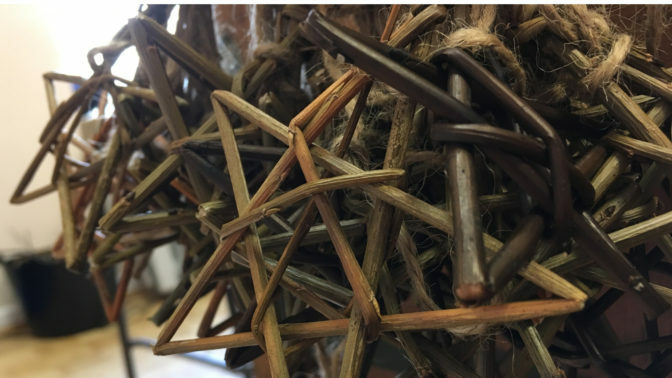 course has been designed not only to be fun and help you create lots of wonderful things for Christmas but also to give beginners and intermediates a taste of the varied techniques needed to create all sorts of willow wonders. During the two days, you will be shown how to sculpt a reindeer, weave a beautiful angel, make wreaths, stars, platters and string decorative garlands. So, come along and join the fun of a wickedly willow festive season. Suitable for beginners and intermediate makers. For those who attended this course in 2017 there will be some new items to make. For intermediate level makers – an ideal follow-up to the Baskets for Beginners course.